I’d experienced culture shock for the first time back in 2011 when I first visited Bali. The arguably organised chaos and bustling day-to-day activity was enough to open my eyes up to the difference between cultures and just how lucky we are to live in a country like Australia. Travelling to South East Asia is an experience, let’s put it that way. No matter where you go there’s always the same element of chaos and madness we never get to experience back home. It’s exciting, challenging and stimulating to the first time traveller, there’s no doubt. I thought the streets of Bali or Bangla Road, Thailand were the extreme ends of the spectrum as far as that’s concerned…that was until I arrived in the city of Jakarta – The ultimate location to heighten the senses and really push the limits of your comfort zone. Take Bali, and then multiply it by ten with a heavy dose of steroids and you have yourself the unmistaken king of concrete jungles – Jakarta! I’d prepared myself for just how busy it would be, but the mental preparation is always underwhelming until you get to live it first hand. My dad had travelled to Jakarta previously and offered a few thoughts, as had a few other friends and family members. The first thought that strikes you is, how does Jakarta city even function? That’s well beyond me and any appropriate reasoning or justification I could give. The relentless ‘honk’ or double ‘honk’ from my driver and other motorists who seemed to successfully dodge and weave their way unharmed through thick, peak hour traffic was a sure testament to how that seeming lack in functionality was obviously not the case. Mopeds zigzag haphazardly in every direction imaginable, all while trucks and SUV’s are bumper to bumper desperately trying to nose ahead of one another. I sat there in the back seat writing this article as my distraction in what was literally the most incredible and yet unbelievable surrounding of complete madness – Ever. I booked a driver through the hotel I was staying at (Novotel, Tangerang) the afternoon I arrived. The cost for a six-hour trip with the Blue Bird service was 900.000 IDR (approx $90 AUD). Now the drive alone to Bogor was approximately three hours with traffic, so there goes the 900.000 IDR straight up once you include the return trip. The hotel advised I’d need to pay an additional 120.000 IDR for each additional hour with the driver. I agreed and booked. Bogor is situated south of Jakarta city and rests among the highlands of Java, at the base of Mount Salak. If you can avoid travelling to this location on a weekend, good chance is you’ll get most of the waterfalls to yourself. Driving into Bogor you notice the huge towering mountains that I mistook for volcanoes. They were unbelievably tall. I don’t think I’ve ever seen a mountain as tall as the ones when you approach Bogor. You’ll pass through multiple tolls on route (covered in the driver cost), and you’ll notice the landscape begins to shift to a more mountainous/jungle atmosphere. We were greeted by standstill traffic on this particular Tuesday morning in Bogor. Expect to dodge and weave through mini vans and scooters and also idle in stand still traffic for at least 20-30 minutes. The road winds endlessly upwards until you see a small sign for Curug Cegmea waterfall. Upon arrival, park in the designated parking lot, pay for your admission (15000 IDR) and begin your descent into the valley. 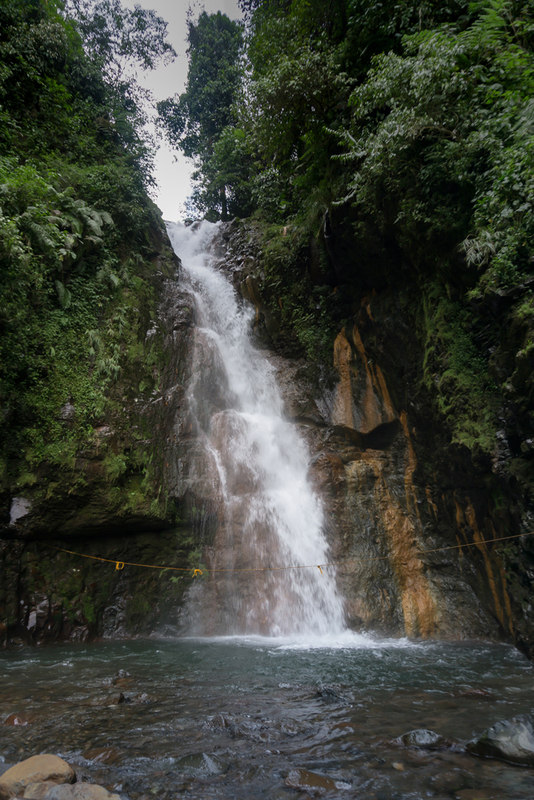 The waterfalls can be heard from the top of the trail as you make your way through the local village and stalls. 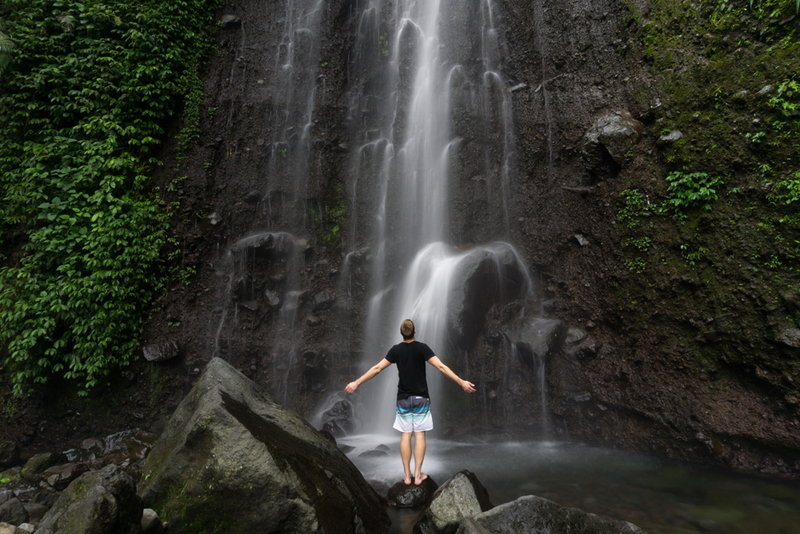 Consisting of two twin waterfalls, Curug Cigamea is mind blowing. The force behind the falls is phenomenal. My driver was happy to let me spend a good half an hour to forty five minutes at each stop to allow me to get a few images and record some video. Once you’ve taken it all in, begin the climb upward to the car park. Next stop, Curug Nahnka. Much like Curug Cigamea, Curgu Nahnka is nestled in amongst valleys and jungle. 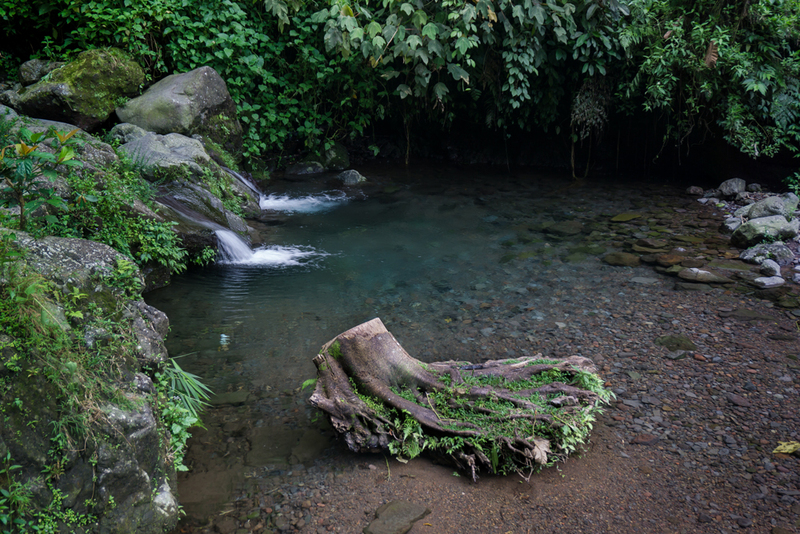 The short hike requires a bit more skill than that of Curug Cigamea, involving a balancing act of rock hopping and wading through shin deep fresh water upward along the rivers and streams. The cavern that Curug Nahnka is situated in is beautiful. The falls cascade twenty meters or so into the pool below. A guide was enlisted to me prior to commencing this walk, but you can easily find it without one. The path is clearly defined and established. 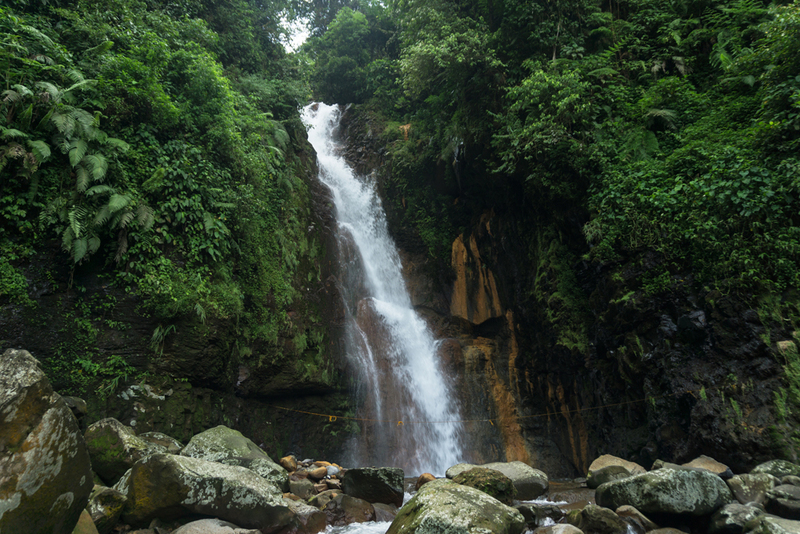 Continuing further upstream you’ll find the final waterfall on this circuit – Curug Kawung. The remainder of the hike from the beginning of the Curug Circuit is quite steep and requires some time, not to mention a fairly adequate fitness level. I’d recommend all ages and fitness levels to give this hike a go, just be mindful that it is slippery in places. Just take your time and enjoy the surroundings. My guide was very enthusiastic and was virtually running the entire time (while I stumbled and breathed heavily with a backpack filled with camera equipment) all the way to the end. 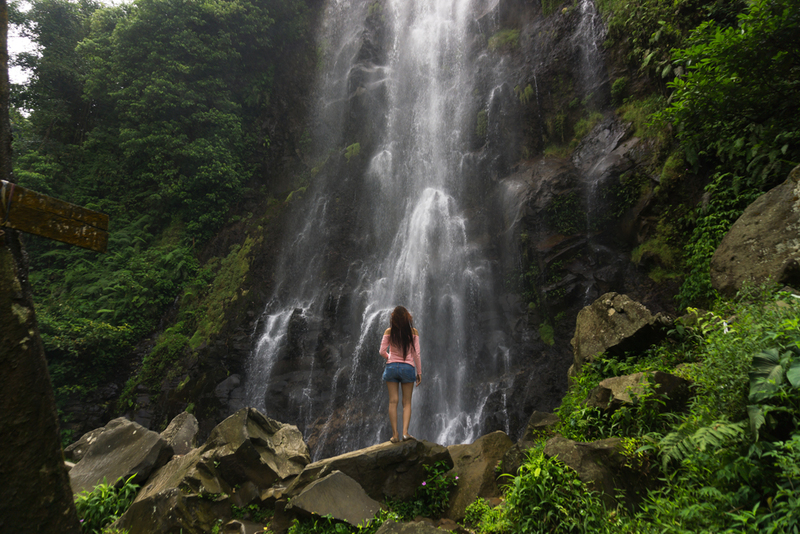 Curug Kawung offers the highest waterfall in this circuit so be sure to stop by and enjoy. The return journey home was busy, as expected. We hit peak hour traffic not only in Jakarta, but also in Bogor. Alternatively, you can catch the train from Jakarta to Bogor for a fairly minimal price (15.000 IDR from what I’ve heard). This offers a good alternative option should you wish to avoid the traffic and chaos in Jakarta city. You would then still need to hire a car or driver from Bogor onwards to the Curug Circuit. All in all, escaping the traffic carnage of Jakarta city for a day is well worth the effort, particularly if you haven’t seen much outside of the main city. Jakarta isn’t just a transit city; it offers a huge variety of adventure activities and hikes all within a reasonable distance from Java’s capital. Explore even further afield in the Far East and you’ll discover ancient cave systems. To the north: hundreds of islands and archipelagos, and further inland; tea field plantations in Bandung. It just takes a little planning and patience, but the experience is definitively rewarding. If you found this article interesting and informative, let me know in the comments below. To see my adventures to Bogor, Indonesia in video, check out the vlog below.